When I saw this beer last week at the LCBO, there was no decision whatsoever whether it was coming home with me of not. Estrella Damm Inedit is a beer from Estrella Damm brewery in Barcelona Spain. It is a combination of a lager and a wheat beer. Their website claims that it is the first beer specifically created to accompany food. Made to accompany the festival of flavours modern cuisine offers us. With its delicate, sophisticated bubbles this beer can take acidic, sweet and sour flavours by the hand. the symphony of flavours in each dish is different, but there can be a common thread capable of unifying them all, for a sense of continuity so there is no need to switch drinks. This beer has a rich and highly adaptable bouquet. In other words a unique personality: smooth yet complex. Estrella Damm opened the brewery in Barcelona in 1876, after August Damm and his wife, Melanie, fled from their home in Alsace in 1872 during the Franco-Prussian war. The brewery has operated continuously since. It is one of the very few breweries in the world that s till operates its own malthouse which produces all of the malted barley required for its beers. 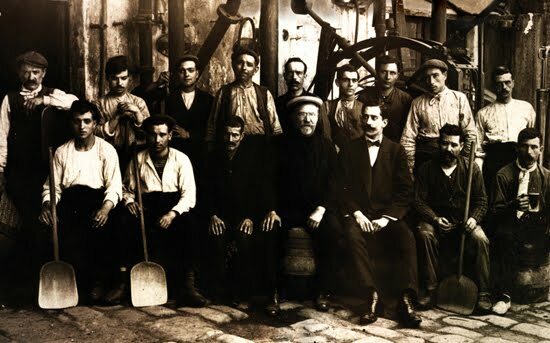 August Damm is pictured with his workers to the right circa 1900. Inedit uses Barley Malt, wheat, hops, coriander, orange peel, yeast and water for this beer. The website also says there is liquorice in it too. Hmmmm. I followed the instruction on the website which said "To deliver the best of Inedit, we suggest keeping Estrella Damm Inedit in a wine cooler while it is being served in white wine glasses. It is important not to fill the glass more than half full so as to appreciate all its virtues. In good preservation conditions, Inedit will evolve towards new taste and nose registers." The beer pours a straw like colour, slightly cloudy with a white head. It does have a nice aroma and I can pick out the orange. Although 4.8% APV, it tastes much lighter. It is lightly spice and although I could not detect any liquorice in it, the orange does come through in the finish. This is a very nice, refreshing beer, which I could see going well with a meal. Wish I had another bottle for the roast chicken that Teena is making for supper.